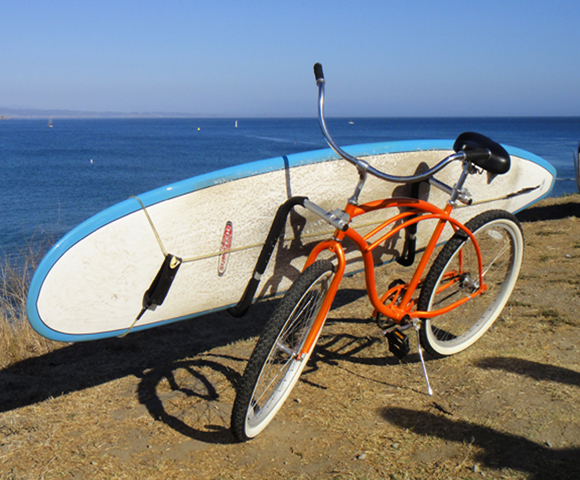 I hadn’t heard of surfboard bike racks until I started doing some research for bike racks for this blog. I am not a surfer myself, although I have always loved watching them. I spent a good amount of time watching the surfers when I visited Manhattan Beach in California a few years back. They are a talented bunch, to say the least. I assumed they either carried their surfboards to the beach or just used their cars. 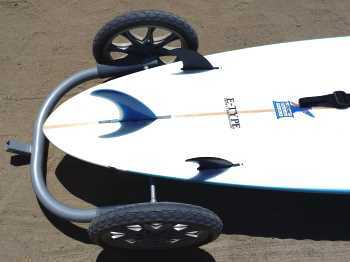 If the beach is a walking distance away, looks like there is a cheaper way to bring your surfboard to the beach with you and save some gas along the way. 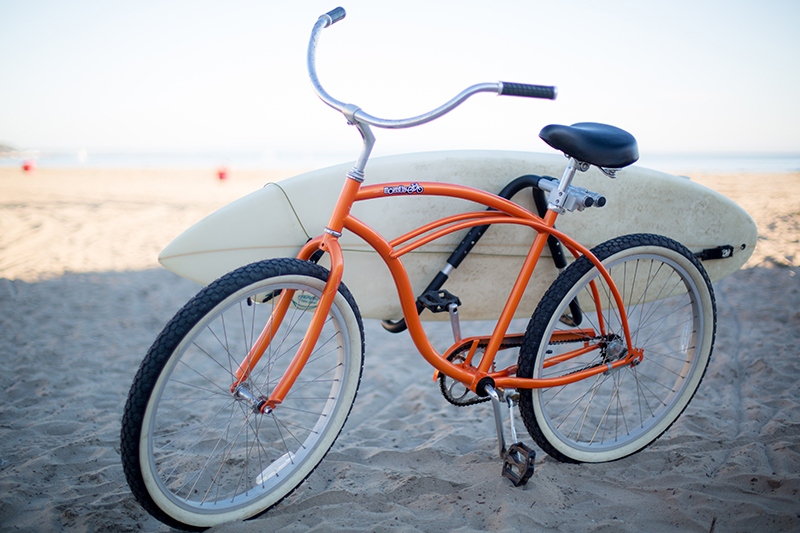 Ride your bike, warm up the legs and bring your surfboard with you. Sounds like a win-win situation to me. In this article, I am going to give you as much information as possible about six surfboard bike racks that I think to be the best, at least according to the reviews and ratings they have received from actual users on Amazon.com. I hope one of them is the perfect fit for you. There is a bonus review for an interesting product called “Wheele” at the bottom of the page. Make sure to check that out. Carver Surf Racks has been serving the surfing community since 2003. 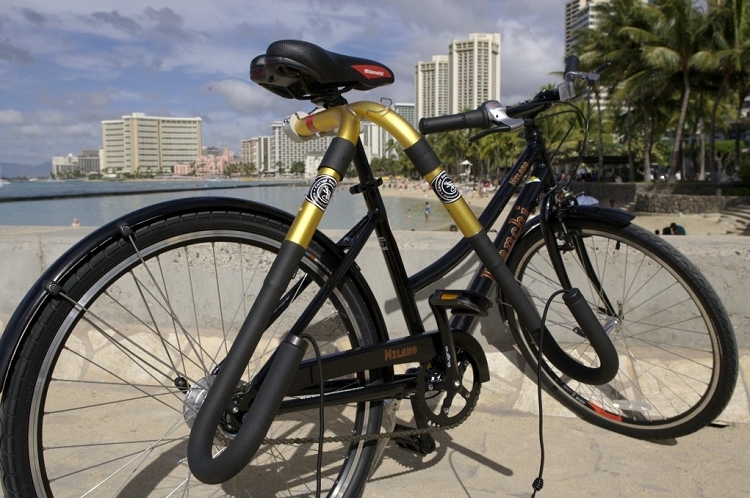 Its founder, Orlando Baker designed his first product in Oahu, Hawaii. The company has been serving over 40,000 surfers since then. 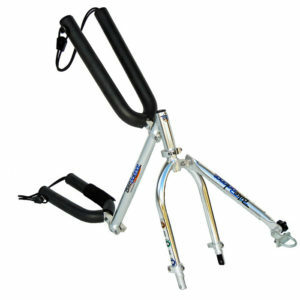 If you would like the see the latest prices for Carver Surfboard bike racks on Amazon, click here. The Mini is designed to fit boards up to 8 feet long. It is made of TIG welded 6061 aluminum and currently, the only color it is available in is black. It is rustproof. 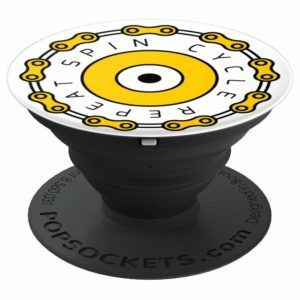 It is designed to mount most seat posts between 25.4mm – 31.8mm (about 1 to 1.25 inch). It has adjustable lower arms. 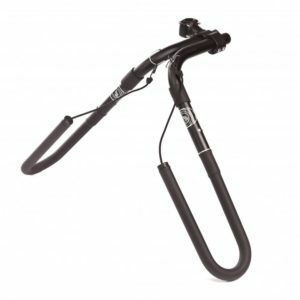 According to the manufacturer, it should fit even the full suspension mountain bikes, and won’t mar or crush the bike frame. As long as you have a clear access to the seat post, it should fit without any problems. Its dimensions are 8 x 16.5 x 5.5 inches and it weighs about 1.2 pounds. 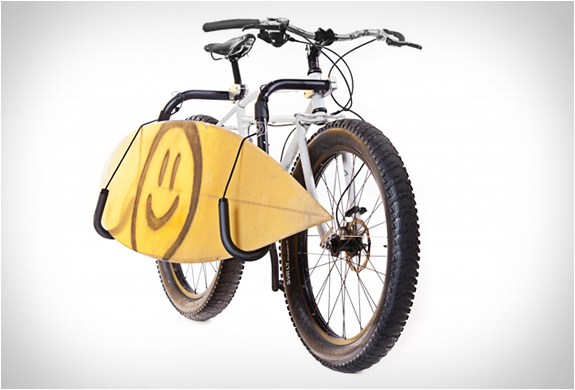 You can fit one surfboard or one body board, or two skim boards. It does make the bike a little unbalanced when it is mounted, however, it is not something that an experienced biker can’t handle. It can only be mounted vertically. The Mini’s lightweight design allows the entire rack to be easily broken down and packed in a bag. CRX Max is the big brother of Mini, it has as wider mounting stance and fits larger boards up to 10 feet. Just like mini it will not rust and it is aluminum and it currently available in black, although other colors might be available later. It mounts to the rear of most bikes. The integrated rear rack is included. It weighs about 5 pounds, and its dimensions are 5.7 x 15 x 17 inches. It can be mounted on a hybrid bike. It may wiggle a little, especially with a longboard. You should make sure the surfboard is balanced, front and back when it is on it. Also, if you make sure all the connections are tight the wiggling should not be that much of an issue. You can disconnect the arms very easily and ride with just the rear rack. It is probably not wide enough for a paddle board. 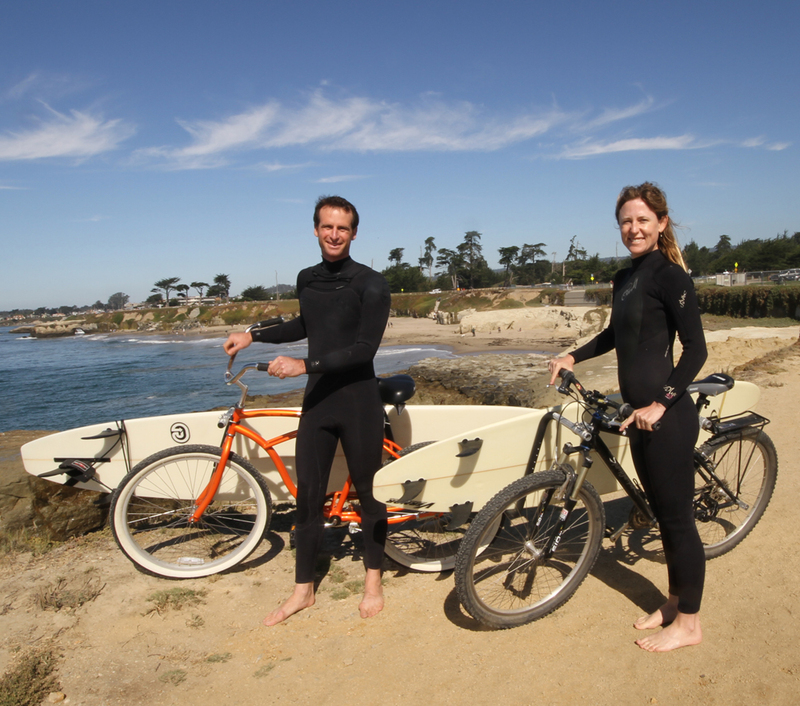 Moved By Bikes is a company based out of Santa Cruz, California. It was founded in 2011 and has two racks, one for shortboards and one for longboards. Both of their products use tubes that are mounted to the head tube of the bike. The head tube is one of the strongest parts of a bike frame, so MBB design uses that to its advantage. They include hardware to fit a wide range of head tube sizes and frames. If your bike has a raised head badge they recommend removing it to provide a smooth clamping surface up front. Both MBB racks are made of anodized aluminum tubes with stainless steel hardware. The tubes also have foam padding to prevent damage to your board. The tubes have a clearance that fits a board up to 3.5 inches in thickness. This one uses a double mount on the seat post which allows the rack to be installed quickly. It is designed to fit boards up to 7 feet. The shortboard fits really well, you don’t have to hold the board while biking. 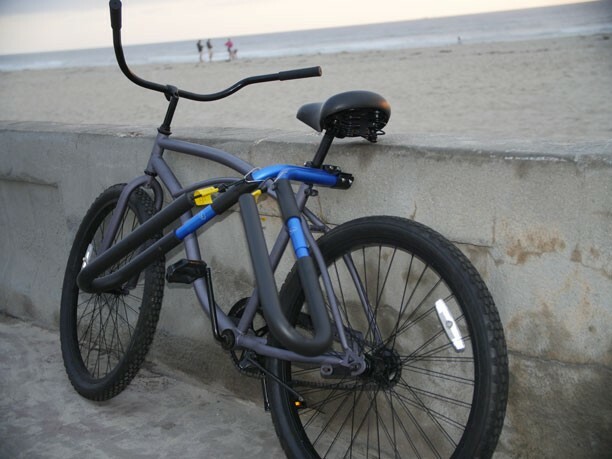 Both the longboard and the shortboard racks use the same seat post clamp, however, for shortboard MBB includes a twin tube clamp to secure a second mounted tube. 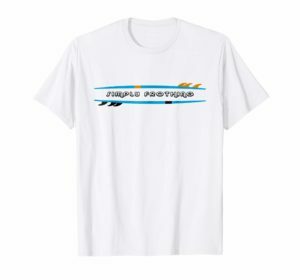 This design allows you to mount both tubes to your seat post, which makes it perfect for shortboards. It has to be mounted vertically. It works well with a fat-tire bike as well. It can easily be removed when not in use if you have concerns about being stolen when you leave it on your bike unattended. 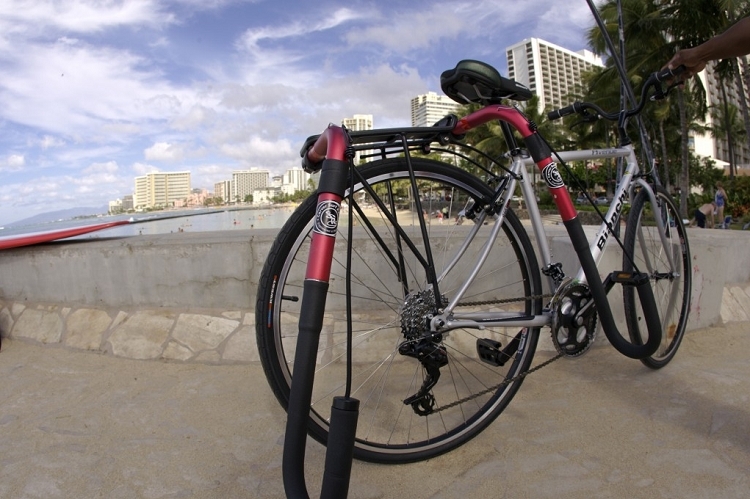 The longboard rack can be either mounted to the rear seat post or to a rear bike rack. If you have a big longboard, mounting to the rear rack is the better option. It can carry boards up to 12 feet and 20 pounds. MBB longboard rack can work with a board as heavy as 25 pounds but that might be pushing it a little bit. Click here if you are interested in watching an installation video for Move By Bikes surfboard bike racks. Steve was born in a small town in Wisconsin. Then he moved to California and became a surfer. Finally, he decided to sell mouth mount for surfers when he realized that nobody was selling them at the time. After that, he decided to make a surfboard bike rack. If you want to find out more about where the name Ho Stevie! came from, you can read it here. The Ho Stevie! Surfboard rack works with boards that are up to 8 feet long. 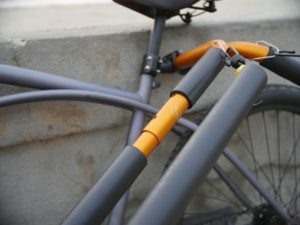 It works well with all kind of bikes, however, if your bike has a lightweight seat post made of titanium or carbon fiber, the rack should not be used with those. It uses bungee cords to hold your board tight and has adjustable arms. It is made of anodized aluminum which makes it lightweight and rustproof. It is available in black, blue and gold. Ho Stevie! 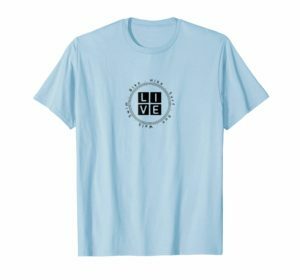 has a lot of cool products for surfers, if you would like to view them on Amazon, you can do so by clicking here. 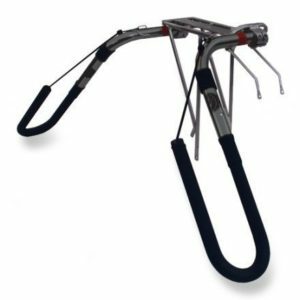 Created by Dr. Dan LaFontaine Bike Balance System has multiple products to make life easier for bikers when it comes to carrying or even pulling stuff while on your bike. 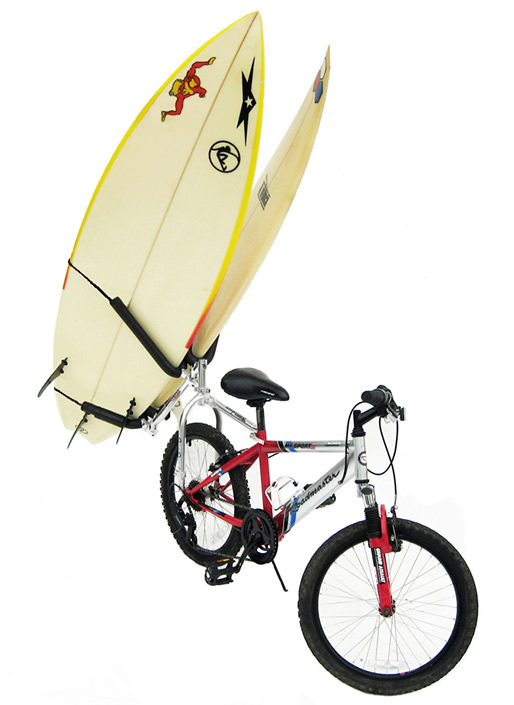 The surfboard rack kit has a rear mount design that is mount to the back of your bike. It has been road tested (at speed over 60 mph), and just like its competitors, it is made of aluminum with stainless steel components. You can carry up to two shortboards at the same time, however, you have to buy and extra cradle arm in order to be able to do that. It fits most single and multi-speed bikes. It looks like it is only suitable for boards that are up to 8 feet. I know this one is technically not a bike rack but I think it is a really practical solution if you choose to walk to the beach instead of biking. It gives you the flexibility of not having to carry your board but “pull” it. 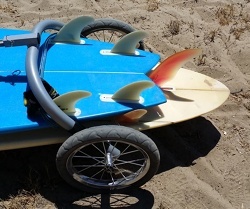 It is simply a handheld surfboard carrier that can carry multiple boards using Velcro, according to the company website, and accommodate 9 to 12’ boards. It has three protection pads and the 13 inch tires on it are made from EVA puncture proof material. You can even remove the tires, It is light and comes with straps so you can pull it easily. Here is a very short video that show how it work. If you would like to view the price for Wheele Board Walk on Amazon, click here. 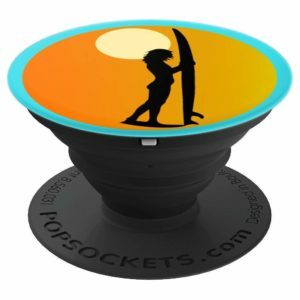 If you are in the market for a cool grip for your cell phone or your tablet, check out this cool surfer girl Popsockets Grip by Amazon. This entry was posted in Bike rack, Surfboard on March 31, 2017 by ozziewizzard.